The pumpkin is a large fruit that is so versatile that it can be used in many sweet and savoury dishes. Pumpkin is packed with vitamins and minerals. Of note, it is very high in vitamin A and C, potassium and the minerals copper and phosphorous. Pumpkin is also very low in calories. NPK fertilizer is often used to grow pumpkin. NPK stands for Nitrogen, Phosphorous and Potassium. One study from 2012 evaluated the influence of NPK fertilizer on protein, fibre, fat and carbohydrates, which collectively are called proximate content. The main focus of the study was to assess the effect of NPK fertiliser on antioxidant activities and antioxidant phenolic compounds in immature and mature fruits of pumpkin. It was found that ‘Between the control and the highest fertilizer rate, proximate compositions decreased by 7–62% while the antioxidant profile decreased by 13–79% for both immature and mature fruits. Across all the measured parameters, mature fruit had higher proximate contents and higher antioxidant concentrations.’ (Food Chemistry, Volume 135, Issue 2, 15 November 2012, Pages 460-463) It seems like buying very ripe pumpkin is a good idea. The conclusion made was ‘ For the high health value of pumpkin fruits to be maintained, little or no NPK fertilizer should be applied.’ Unfortunately, considering NPK can be organic fertilizer, how do we know how much of it was used in the pumpkin we buy? Here it is my version of pumpkin soup that can convert anyone into becoming a pumpkin soup lover. 1. Cut pumpkin into 2cm pieces, coarsely chop onion and garlic. 2. In 3l pot with olive oil cook prepared onion and garlic on low heat until soft. 3. Add pumpkin to the pot with 1 cup of water. 4. Simmer for 20 minutes or until pumpkin is soft. If using baked pumpkin skip this step. 5. Transfer the pot and using a blender process cooked vegetables into a smooth puree. 6. Add paprika, milk, salt and pepper and return back to the heat until the soup starts boiling. 7. Put dry pan on medium heat and fry pumpkin seeds until they start to make noise. 8. 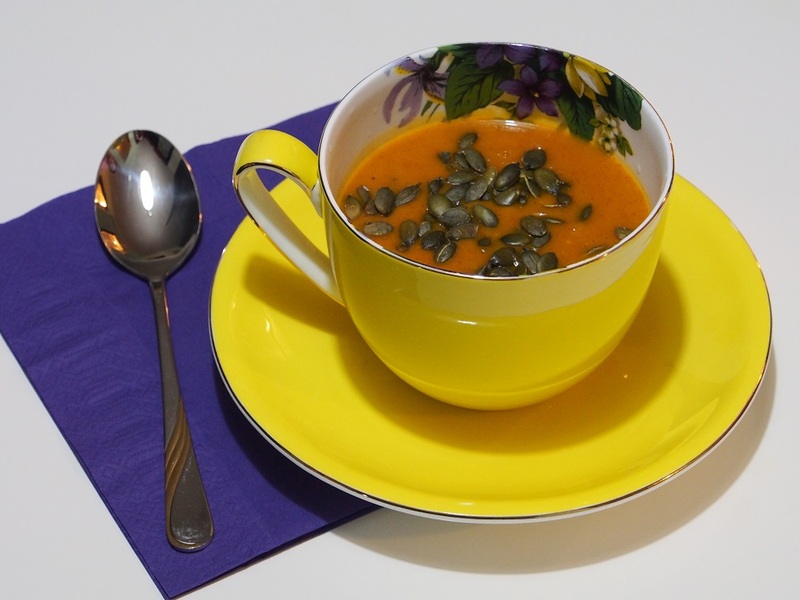 Spread pumpkin seeds over soup just before serving in individual bowls. Alternatively serve the seeds separately.